The City of Buckeye, Ariz., recently obtained its Certified Fleet Management Operation (CFMO) certification from the Government Fleet Management Alliance (GFMA) following a multi-year transformation that allowed the division to become more accountable. Michael DePaulo, CPFP, fleet manager, joined the city fleet in 2006 before it had a strong fleet program, and the division has been working on certification since 2008. By using the CFMO checklist and acquiring knowledge through fleet conferences and meetings, staff members have established a fleet management committee made up of user departments, utilization criteria, a vehicle replacement policy, standard operating procedures, business plan, and service level agreements with customers, DePaulo said. In addition, through better tracking and process improvements, the fleet has been able to make and achieve its goals. For fiscal-year 2013-14, these include fleet availability of 98% (goal of 96%), preventive maintenance compliance of 95.1% (goal of 95%), customer satisfaction rate of 100% (goal of 98%), billable hours at 79% (goal of 78%), and one-day turnaround of 93% (goal of 70%). Staff members were able to call Jim Wright, associate director of the GFMA and president of Fleet Counselor Services, for guidance throughout the certification process. One of the projects Wright worked on for the fleet was determining lifecycle costs of certain classes of vehicles using historical data and using it to determine vehicle replacement schedules. The success of the fleet transformation is the result a manager open to trying new ideas and staff members who truly care about customer service, DePaulo said. “We have a good organization, from the top to bottom, from our public works director to the people who work for me,” he said. The city fleet consists of about 350 units and staff of 6 full-time employees and one part-time intern. 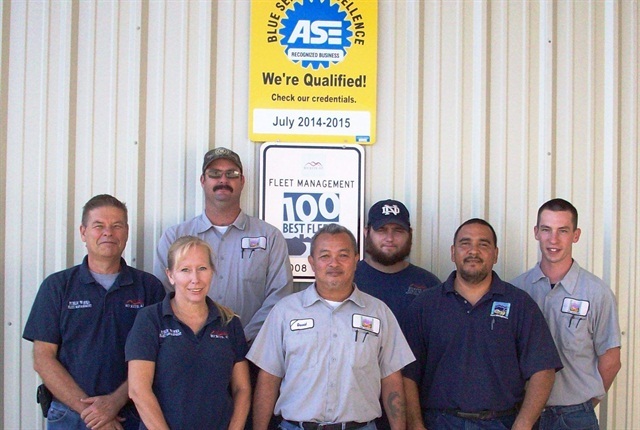 The fleet has been an ASE Blue Seal shop for seven years. Other recent CFMOs include the City of Portland, Ore., City of Anaheim, Calif., and City of Austin, Texas.